The untold story of the role of Catholic nuns during Northern Ireland’s troubles. The whole world saw the picture of Father Edward Daly waving a bloodied handkerchief as he escorted a dying teenager out of the line of fire on Bloody Sunday; many books have been written about the role of Catholic priests and Protestant clergy during 30 years of 'The Troubles' in Northern Ireland. But the stories of Catholic Sisters working in schools or living on the Peace Line in Belfast, have not been heard. Over a two-year period 20 nuns have been working with projects at the Universities of Queen’s Belfast and Winchester to redress this gap in Northern Ireland’s history. They shared their stories with one another during a series of Witness Seminars. And now the Sisters have gathered again to tell them to a BBC World Service audience. The Documentary is presented by Sister Geraldine Smyth, a Dominican, and associate adjunct professor at the Irish School of Ecumenics at Trinity College, Dublin. 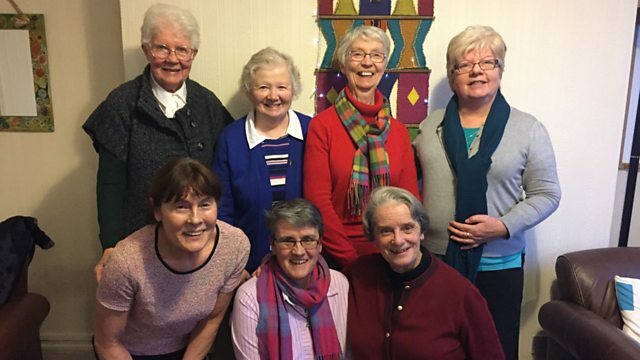 In the run up to the 20th anniversary of the Good Friday Agreement, which ended 30 years of sectarian conflict, listeners will hear about the daily risks the Sisters took and the practical and spiritual challenges they faced. These are stories of trauma, anger and shaken faith but tales too of laughter, hope and reconciliation.